Bright pink flowers with a white edge make Azalea Mrs Kint a standout out. Mid to deep green foliage adds contrast to the bright flowers. This is a fairly compact shrub and requires little care once established. Although evergreen, like all Azaleas, Mrs Kint will drop some leaves in autumn. Best grown in afternoon light shade in all but the coolest climates where full sun is suitable. Dig in some well rooted compost before planting. In containers use a specialist Azalea and Camellia potting mix. Water in well after planting and mulch lightly to help retain some moisture and a cool root run. Fertilise each spring with a specialist Azalea and Camellia fertiliser, or your favourite organic fertiliser. Use Azalea Mrs Kint as a low growing shrub in the garden border, or as an understory plant beneath tall deciduous trees such as Japanese Maples. Also suited to growing in containers where the bright flowers will brighten a courtyard or decking area. Regular pruning light pruning immediately after flowering is recommended, this will keep the plant in a bushy rounded shape. Any long growths can be pruned back at this time as required. Height – Will reach to around 1 metres in height. Spread – Will spread to around .6 metres. Soil – Humus rich, very well drained slight;y acidic soil. Flowers – Red with pronounced white edges. A White flowering variety is also available. 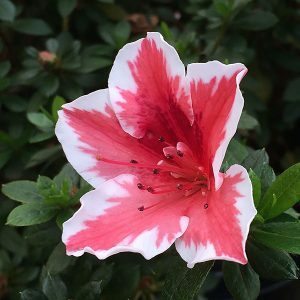 Azalea Mrs Kint is available for sale from the following nurseries.